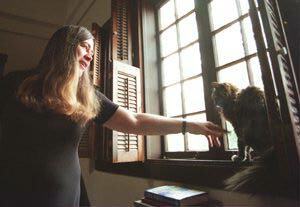 Carolyn Schwebel pets her cat in her Middletown home. She remembers sitting on the front steps of her Vermont home one night a long time ago, staring up at a big, fat moon and trying to bargain with God. But neither the Man in the Moon nor God in his heaven nor six hospital stays between the ages of 2 and 15 would take away Carolyn Schwebel's cerebral palsy. "The messages from my brain just don't get to my legs," explains the 54-year-old school psychologist from Middletown. She walks with a hand-painted, bright purple cane now, but throughout her youth, she walked and ran as best she could without one. Schwebel's memories of a childhood in small town Vermont are good ones. Her high school graduating class of 27 students voted her prom queen and most likely to succeed. "I was content," she says. "My disability has been with me all my life. It's all I've ever known." But there were moments when she wasn't happy -- moments when she and God could not come to terms; or moments at school dances when she would realize that she could never really be a part of it, could never glide across the dance floor with the ease of her friends. "My sister just sent me some poems I wrote when I was a little girl," Schwebel says. The poems reveal a child with something to prove. "Proudly wave your tail," she wrote to her cat. "Maybe we'll show them yet." Her inner drive took her to college for her bachelor's degree, and graduate school for her masters degree and her Ph.D. Along the way, she married John, her husband of 26 years. Somehow, her journey has always led her back to kids. For the last three decades, she has been a psychologist in various school systems. She has studied high school students, middle school kids and, most recently, elementary school kids. Are they as content as she imagined herself to be as a child? "Their anger scares me," she says. Kids are much more vocal now about their discontent. They demand respect from their peers. Schwebel is circumspect, not given to making generalizations that the evidence won't support. But maybe, she allows, respect has become such a rare commodity in the world, so precious, that if a child perceives even the slightest sign of real or imagined disrespect, it is enough to ignite violence. Children today may not have the time to be as content as she was, she says. "Their lives tend to be overprogrammed," she said. Parents driving them to soccer, to band, to this or that activity. "These programs are valuable," Schwebel said. "But kids may be losing the ability to create their own activities, to use their imaginations." That puts them in the same place as many adults, who seem lost without constantly provided stimuli. She understands what Kurt Cobain, of grunge band Nirvana, meant when he sang, "I feel stupid and contagious/Here we are now, entertain us." For her part, Schwebel feels content in her life and her work. But when she looks out at the world, at the unfairness built into society, at laws designed to protect and provide access for those with disabilities going unenforced, she is anything but satisfied. "Call me a contented malcontent," she says. She serves on both the Middletown Human Rights Commission and the Monmouth County Human Relations Commission. It's frustrating, she says, to go to a planning board meeting and feel "invisible." It's hard, she says, "trying to speak the truth to people who just won't listen." But part of what it means to be at peace with herself is, for Carolyn Schwebel, to keep on speaking, to keep on trying, to keep on walking, using those disabled legs which have brought her so far.